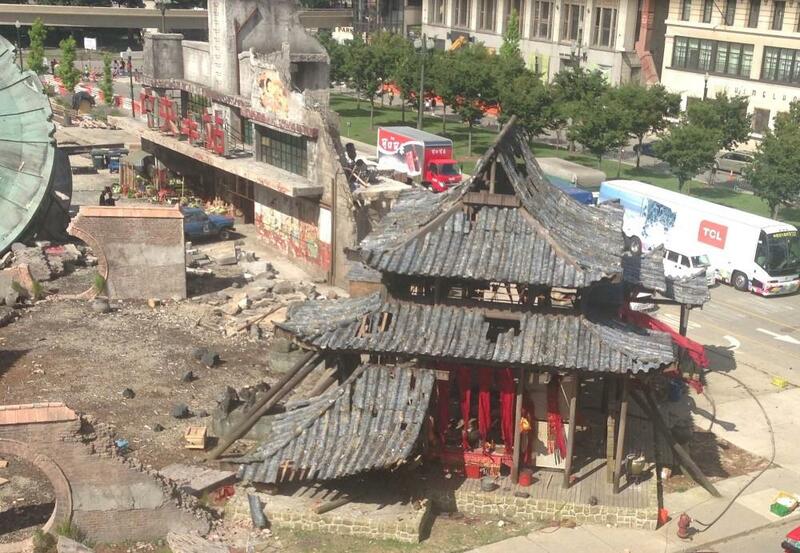 A few more videos have popped up from Transformers 4 filming in downtown Detroit. The first video goes hand in hand with the pictures from yesterday as the cast discussed the scene with Michael Bay. It also goes with a scene description that was being filmed on Wednesday with Stanley Tucci and Jack Reynor running across the set carrying a large black bag. From there Tucci moves forward to have a conversation with a Transformer (the pole a crewmember is holding). 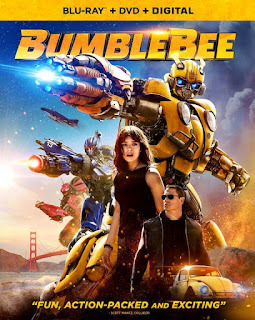 Judging by the pole height and Mark Wahlberg's casual pose, probably an Autobot like Bumblebee. The second video shows a Subway car (the Chicago one?) being dropped a little bit above the height of the People mover as "panicked" extras run screaming down the street. The last video goes with the image above from Jerry B. as the giant pagoda has some sizable explosions go off inside it and the street outside. No the main battle takes place in china, blowing up several famous buildings. definteley this is the final act , it will be an interesting one , to see in my opinion . Im still searching for prime , optimus prime , the hero , hopefully he's not in hell , come on prime , lets roll . Stanley Tucci is awesome! But they are only using a stick now, without a face on it. I seriously hope Bay is screwing with us, but I'm thinking the production team was scared with the 'leaked' facepole and had enough of it, that they are removing all the faces from the poles. Why use faces anyway? It doesn't have to be the actual face of the TF, it very well can just be a stick, of just a blank board on it. The actors already know what bot they are talking to, they have a script. I bet the ohter 2 Cybertronian keys are in the bag. Oh Matt, that is indeed very, very scary! 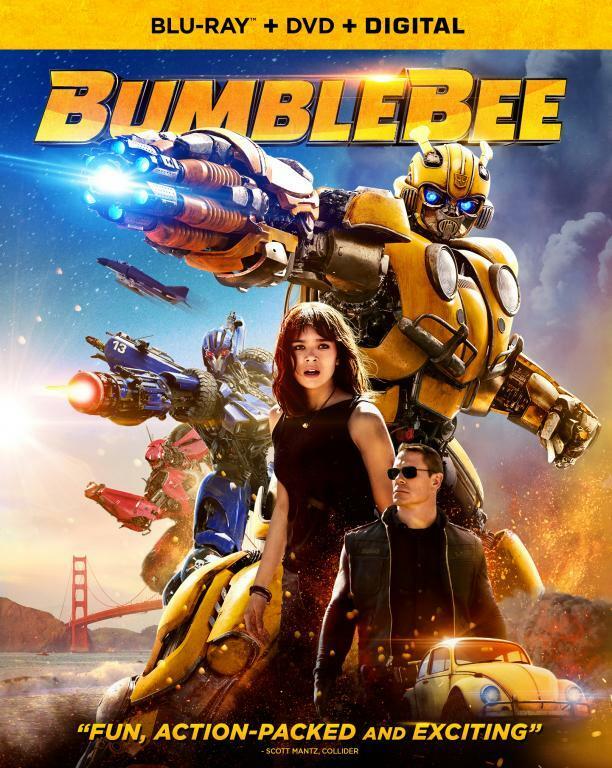 As the actual name, of production name? Brrr very scary, Grimlock is far more popular character than Hound (or Kup). It almost doesn't matter anymore who it is. Bay is screwing up with designs like this. You just can't have human faces on robots. Do you have any info on why there is no face on the stick, that Stanley Tucci is acting with? Are they finally coming to their senses not to use the actual heads? Are they scared for leaking info, like on what TF are on set, or are talking to? Truth be told I don't have all the answers. Apparently they will be done shooting next week..apparently. it seems that tucci is talking to a bot we already know the look of so there's no need for a face. For what its worth I like the heads gives you a slight indication of who your seeing and what kind of character your seeing. I've just emailed the blogger on this site about more information ive managed to get a hold of whether it's true or not is another thing but yeah. Goodenoughpictures on Youtube has a very nice and plausible theory: Autobot X from the G1 cartoon episode! That would very cool! But I still don't think the Stunticons are in the movie. But also he is one of the many people who think the human scientists maybe built the ship prop from the other day, wich was taken on a lot with the bigger turbinepart in the back. It's obviously the middle part of a Dark of the Moon Decepticon ship, I compared pictures, it IS the middle part of one of those ships. Yes they will use it, but did not made it. They most probably used to make their own ship, that was spotten on a trailer on the highway.